Rose hips are dark-red strong berries, fruits of rose plants (Rosa rugosa). They have been used for many centuries for their exceptional contents of nutrients and vitamins. Studies has shown that rose hips are as rich in vitamin C as lemons and blackberries. In addition, rose hips are rich in flavonoids, antioxidants, essential fatty acids, calcium, iron, niacin, tannin, phosphorus and other important nutrients. Health benefits of rose hips are numerous, and such products as rose hip tea, rose hips infusion or tincture can be used both internally and externally to assist us in getting rid of various sicknesses and aliments. Using hot rose hip tea can effectively ease the symptoms of cold or a flu, like coughs, running nose, headaches, fever and so on. As a very rich natural source of vitamin C, rose hips can boost the function of our immue system and lower the risks of catching many infectious diseases, and bioflavonoids can help to rejuvenate and reconstruct our body tissues. Rose hip tea is rich in iron that works great for strengthening our cardio-vascular system and improving our blood quality. Health benefits of rose hips include therapeutic properties of this natural product to lower inflammation and speed up natural healing processes in our body this way helping our skin to heal bruises, cuts, irritations and so on. 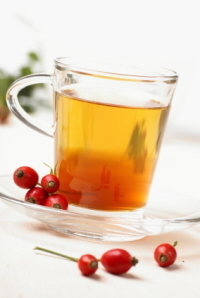 Regular consumption of rose hip tea is linked to improved function of bladder, lower risks of developing kidney stones, improved digestion and so on. There are special health benefits of rose hip tea and capsules for women as this natural remedy can assist in calming down menstrual pains, reducing cramps and calming down the symptoms of PMS. It can be used by everyone who suffers from chronic stresses, depression, anxiety, hopelessness, chronic fatigue syndrome and other related health conditions. Remember that for some people there are side effects of using this herbal remedy like heartburn, nausea, headaches, insomnia and others. That is why it is better to consult with a doctor or health care specialist before taking a therapeutic program involving rose hips.